My father has a tendency to do to my mother like to what Duc does to me - he finds random objects at the grocery store and buys it just to see what can be done with it. One Saturday afternoon, my mother asked me what to do with "pig potatoes." I was confused. What the heck was a pig potato? When she dropped the three pound bag of them on the dining table, I immediately recognized them as sunchokes. I pointed that out but she shook her head vehemently and said the receipt called them pig potatoes. Once that paper strip was whipped out, I realized she was right - the Korean supermarket had labeled them as such. But why? Turns out that these tubers are called so because they are often used in pig feed. While they are quite nutritious (there was a placard at the store that was a selling point for my dad on these) and generally tasty, they do have a reputation for causing much flatulence due to an abundance of inulin. That being said, they are not common in restaurants for that reason. Digestive upset surely would deter guests! 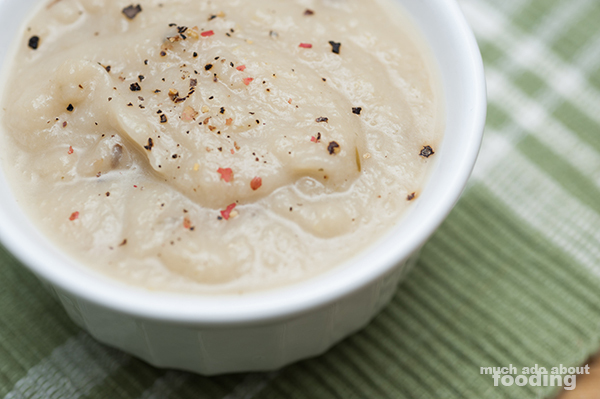 However, if you're going to eat these crisp and slightly sweet sunchokes, you can do so happily at home and perhaps in this pureed soup form! Also known as Jerusalem artichokes, these bad boys look like ginger and taste like a mesh of apple, artichoke, and celery. I like them but beware! Some people may be a bit more...unintentionally "vocal" after eating some. In a large pot, saute the butter, celery, and shallots until the vegetables are near translucent. In the meanwhile, peel the sunchokes (this can be a pain) and reduce to 1" chunks. Add stock and milk to the pot and bring to a simmer. Add cauliflower, sunchokes, and thyme to the pot. Bring to a boil, then reduce to a simmer for approximately 25 minutes or until the sunchokes are soft. 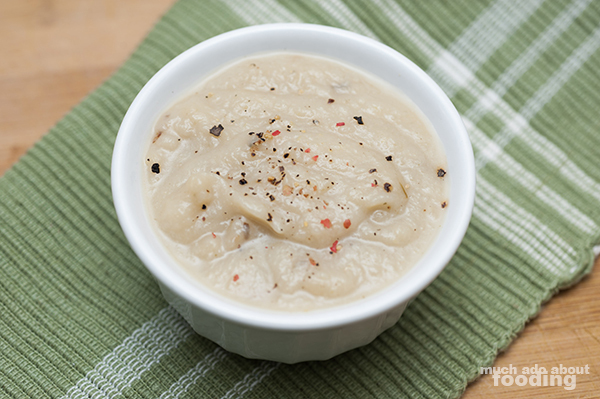 Using an immersion blender OR carefully transferring the soup contents to a blender, cream together the entire soup contents and return to the pot. Bring to a boil. Turn off heat and serve with some freshly cracked black or rainbow peppercorns to enjoy!